Many remarkable women have served MCCW and the women of the Archdiocese for the Military Services during MCCW’s more-than-60-year history. 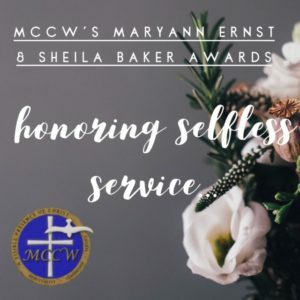 The Sheila Baker and MaryAnn Ernst Awards were created to honor the legacy of two very special women and recognize the contributions made by women in the organization today. Nominations are taken every two years and the recipients are announced at MCCW’s Faith Formation Forum. To learn more or to make a nomination, download the packets below.